Google Latitude started as a service that managed to obtain your location and shared it with a group of people, who also revealed their locations. The service was available as part of the mobile Google Maps application or as an iGoogle gadget. To make the information stored in Google Latitude more useful, you can now display it on a web page, in a feed or add it as a constantly-updated Google Talk status. The location can be added to a badge and embedded on any web page, but there's also an option to get a list of the most recent locations as a KML or JSON feed. 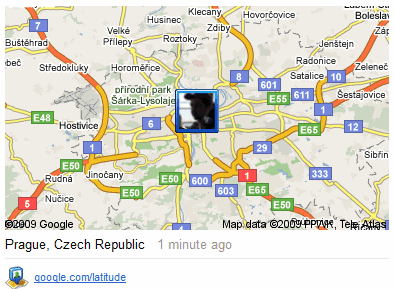 Since you may not want to share your precise location, Google Latitude has an option to display the city-level location. If you only want to share your location with the Google Talk contacts, enable the new location status. The feature "automatically updates your status message with your current city's name as you move". It's interesting to notice that the two new features are actually applications and it's likely that Google Latitude will implement an API that could be used by other location-based services, much like Yahoo's Fire Eagle. "They are two separate apps, so you can select which one(s) you'd like to use and customize exactly how you'd like to share your Latitude location. (...) Both apps adhere to the same terms and conditions -- you must explicitly opt in to the application and of course, you can always disable an app by going back to the app's page," explains Google. "Apps use the same location as the Google Latitude location tied to your Google Account. While Latitude is enabled and updating your location from your mobile phone or iGoogle where available, your apps will show your most recently updated location. If you simply stop updating your location from your phone or computer by closing iGoogle, letting your phone run out of battery, turn your phone off, etc., your last updated or manually set location will still be visible in your other apps, even if it's old," informs the help center. The location from Google Latitude, which is obtained from a variety of sources (GPS, cell towers, WiFi location), could be used in many applications: better local results in Google Search, easier to use GOOG-411, viewing your routes in Google Maps, customized geo-alerts and probably other useful-but-somewhat-creepy services. On the map embedded in the article, I actually see you located in "Prague, Czech Republic" with map of Prague being displayed. Is this correct?! Yeah, I am excited there are some apps coming out for Latitude! I still would kind of like a stand alone page or app for Latitude itself (in addition to the iGoogle gadget), with some some interactive features, ping, nudge, set up alerts, etc. This is what I've been waiting too! Fantastic news! Oddly enough, it seems to be more state level for me rather than city level. If I view my location in iGoogle, it come pretty close to getting it right (apparently using the cell tower rather than the GPS... not suprising being that I'm inside). But the badge and the chat status only have the State that I'm in, not the city. Come on Google, get Latitude free of iGoogle ! I'm guessing we won't see it on the iPhone until the 3.0 software comes out.